Part of Lenten obligation is to abstain from meat on Fridays – so for the Fridays during Lent, I’ll be sharing some delicious meatless meals. Whether you’re abstaining from meat for Lent or just looking to add some new meatless meal ideas, I hope these posts give you some inspiration. I’m so excited to kick off this year’s Lenten dinner series with this recipe because it’s a real winner! Chinese takeout is one of my favorite Friday night meals – but unlike pizza, it’s harder to do during Lent. Chickpeas aren’t on the menu at our local place but it turns out they make a pretty fantastic substitute for chicken. This meal was one of those times you don’t miss the meat – it was flavorful and filling. Even the often-skeptical husband was a fan! In a small bowl, whisk together the first six ingredients. 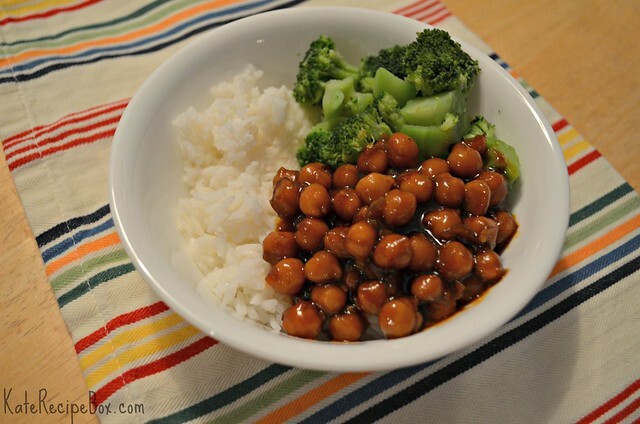 Stir in chickpeas, cover and refrigerate for at least an hour to let marinate. When ready to cook, heat the remaining 2 Tbsp. coconut oil in a large pan. Drain and discard the marinade and add the chickpeas to the pan, along with the kung pao sauce, garlic, ginger and red pepper flakes. Saute for 6-8 minutes, until the chickpeas begin to brown slightly. Serve with rice and broccoli. These look so delicious! I can’t wait to try them!